I’m always on the lookout for good pubs, which is a surprisingly tough challenge; the main problem is my awkward list of requirements. It has to be relatively easy to get to (ideally via public transport for obvious reasons). It has to sell a decent range of great beer. And it has to have good food. That last requirement is largely because I’m most likely to be going to the pub with Kavey, who doesn’t like beer (strange, I know) and her idea of a good time doesn’t usually involve an hour’s travel on two buses just to enjoy half a Coke when we get there. The North Pole in Islington certainly ticks all the boxes on paper, so when they invited us along to their press evening we jumped at the chance. The first thing that hits you when you walk through the door is this delicious sight. 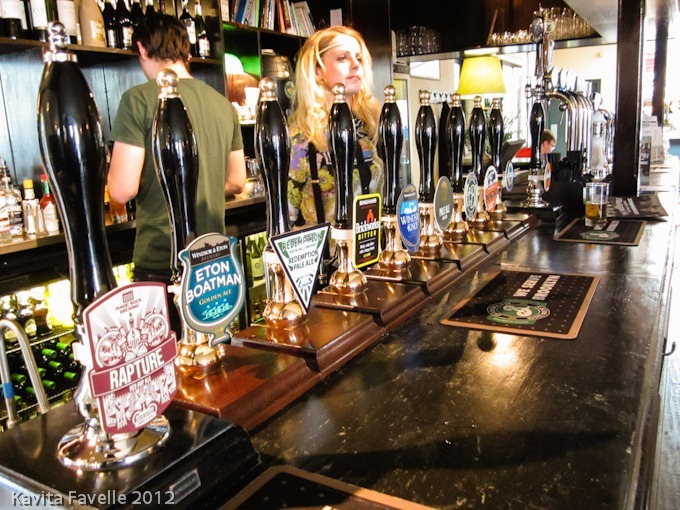 There are seven cask ales and a couple of ciders towards the end, and further along the bar another half dozen keg taps. Oh, and a huge fridge full of bottles too (they have a list of kegs and bottles, although it’s a little out of date). 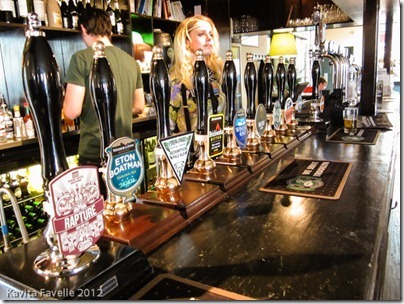 Not wishing to show any favouritism, I have to try all the cask ales, at least. 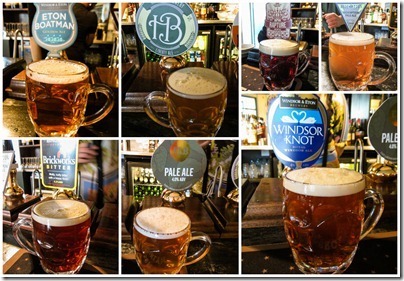 I’m glad to say that local London brewers are very well represented, with beers from Redemption, ELB, Hackney Brewery and (not quite London but…) Windsor & Eton. Also on the bar were beers from Magic Rock and Binghams. Some of these are old friends. I’m always delighted to find Redemption’s Pale Ale available – light, sweet and a gentle hop bitterness which makes it the epitome of a summer evening ale. 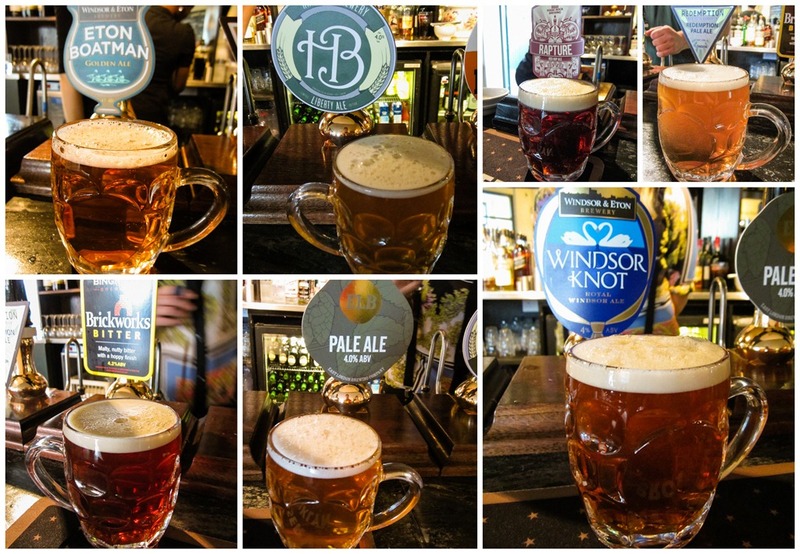 And it is great to finally taste Windsor & Eton’s Windsor Knot in draft form – even tastier than when bottled, with loads of floral satsuma hops and perfectly bitter. It’s definitely secured its place on my Desert Island Beer list. The rest are a nice mix of summer beers. At the traditional end, Binghams Brickworks Bitter is full of biscuity malt flavours and a nicely subtle hop bitterness. Both ELB’s Pale Ale and Windsor & Eton’s Eton Boatman are sweet pale ales with light fruit flavours, delicious and refreshing. Hackney’s Liberty Ale is an interesting one – created to show off the Liberty hop, which brings lots of bitterness and an interesting hint of spice. And finally, Magic Rock’s Red Ale which is dripping with US hops, tasting fresh and sweet. We then move onto a small selection of their bottled beers, although by now my notes, as with the photographs, are a little less clear! There are some big American beers, and also a chance to try the increasingly hard-to-find Bristol Brewers Collaboration 2012 Smoked Porter – a magnificently rich, sweet and bitter beer. So that’s the beers; what about the food? 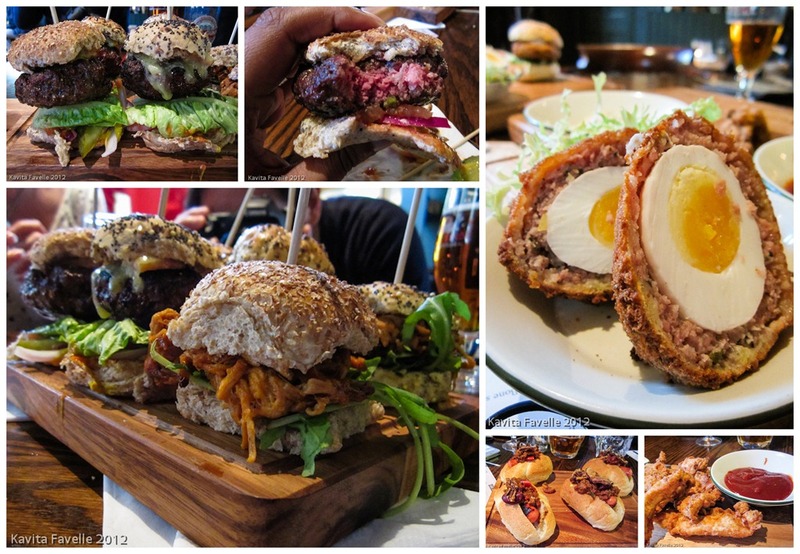 The collection of sliders, scotch eggs and pulled pork are all fairly standard gastro-pub fair, but tasty and well cooked. Some of the other menu offerings, such as the pizzas, are less successful; although our pizza tastebuds may be spoiled by an awesome pizzeria at the top of our road! 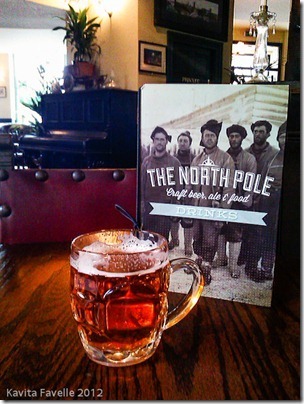 Overall, the North Pole is a great pub, serving an impressive range of excellent beers alongside good food and a nice atmosphere – not to mention a very warm and knowledgeable welcome from all the staff. Pete Drinks was a guest of The North Pole.